Inspired by their years living abroad, the Dubray's Frontenac home balances elegant style with family living. Set on a diagonal, a black-and-white floor creates a stunning effect in the dining room where designer Janice Rohan Hulse incorporated texture and color through wallpaper, furnishings and draperies. In the great room, a stunning cathedral ceiling and stone fireplace give a German feel to the space. Washed in an aqua-gray finish, the kitchen cabinetry adds a subtle touch of color in the otherwise natural, rustic space. 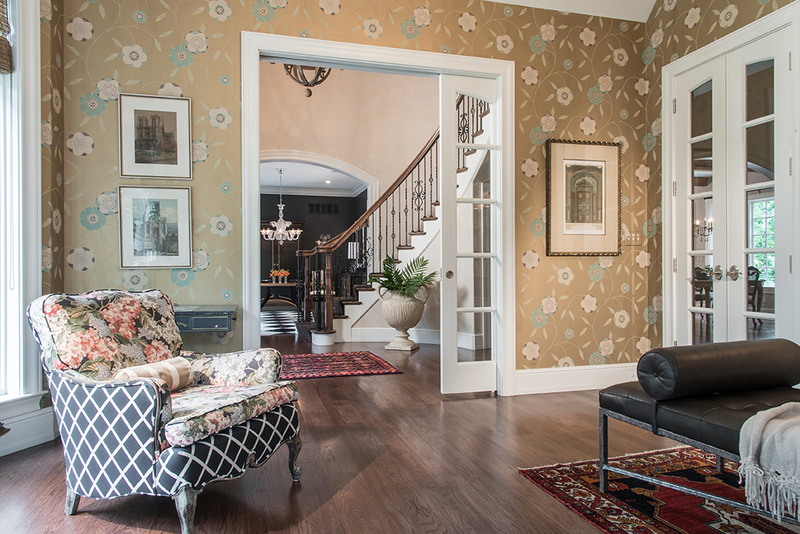 Floral prints on the accent chairs and wallpaper bring the outdoors in in the study. A cystom-designed iron bath canopy softens the freestanding tub. Lilac hues set the tone for the soft, sophisticated master bedroom. Moving back to St. Louis after living in Germany for several years, the Dubray family was ready to re-lay their roots in the Gateway to the West. With three boys, it was a top priority for Julie and Drew to design a home that was both elegant yet functional for their family. “We wanted our boys to want to be at home,” says Julie. With the help of interior designer Janice Rohan Hulse, Park Avenue Design, whom the homeowners met through a neighbor, their two-story Frontenac home is not only workable for all, but reflects the worldly style they came to love. Janice was brought in at just the right time during the building process and helped with outlet placement, fabric choices and furniture purchasing and placement. Having previously lived in a ranch, the homeowners purchased mostly new furniture mixed with a few favorite old pieces. “Going from 8- to 10-foot ceilings, a lot of the existing furniture was too small for the new home,” Janice explains. To complement the new furnishings, artwork and accessories, a neutral palette was layered with color, especially subtle pops of aqua. 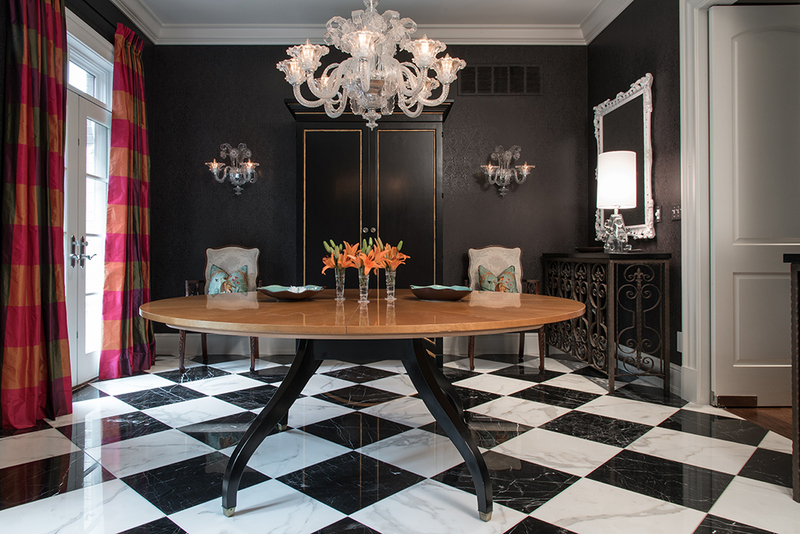 The black-and-white flooring set on a diagonal creates a stunning effect in the dining room, where a six-foot, maple-topped round table with a spider-leg base can seat as many as 10. Another neutral aspect, the wallpaper is a charcoal tone-on-tone filigree design. For a pop of color, Janice chose a vibrant multicolored fabric for the window treatments. “Her fabric choices are beautiful,” says Julie. In a house full of men, there isn’t much pink to be found anywhere. “This is where Julie could have her own touch of pink,” Janice says. 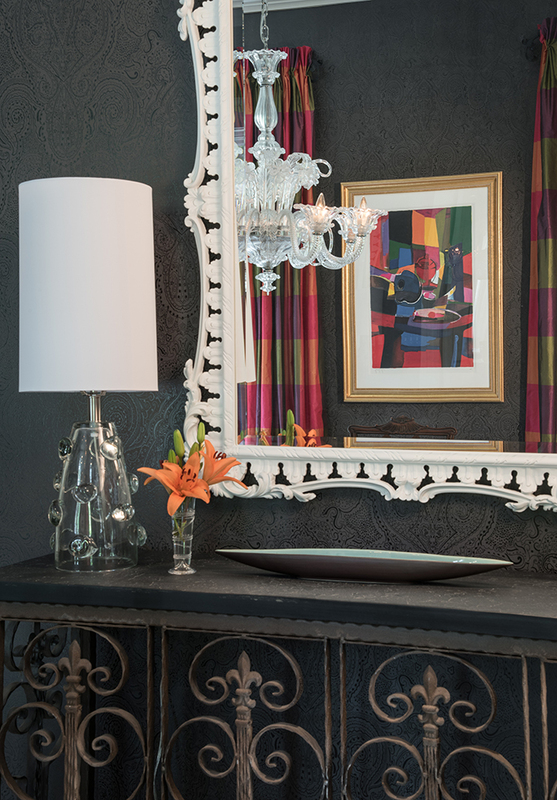 In addition to incorporating pops of color, Janice also likes to juxtapose the finishes on furnishings and fixtures. For example, the console tables are made of rusty iron and topped with pieces of polished granite. “I like to contrast really finely finished pieces with crusty pieces of metal,” she says with a laugh. 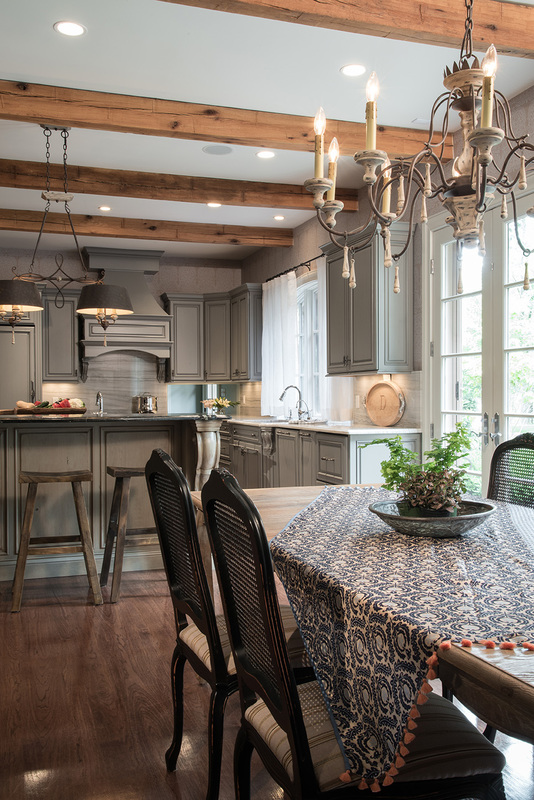 In the kitchen, which connects to the dining room through a small bar area, Janice brings in the touch of roughness through the island and dining-area chandeliers. Their metal finish is a textural contrast to the sheer draperies, natural bleached-wood breakfast table and soapstone countertops with beautiful veining. The kitchen fixtures, as well as all the other light fixtures found throughout the home, were carefully selected to ensure continuity, yet each has its own differences to give the home a custom-selected look. For another custom look, the kitchen cabinetry was custom-finished to fit the style of the home. Washed in an aqua-gray finish the cabinetry adds just a subtle touch of color in the otherwise natural, rustic space. Custom cabinetry also plays a major role in the décor in the great room, which features a stone fireplace surrounded by custom-built bookshelves that house prized accessories from travel and family mementos. “Lots of attention was put into the finish to make sure it complemented the kitchen cabinetry,” Julie says. A signature of Hennessy Construction, which built the home, the cathedral ceiling in the great room has a very German, warm feel. The real-wood ceiling complements the neutral furnishings and draperies. Janice zoned the space for a seating area with a separate confluence area for when the family entertains. The printed linen draperies set the tone for the color scheme as Janice pulled out neutrals to establish the wall color and fabric choices. A classic balloon chair is the statement piece in the seating area. 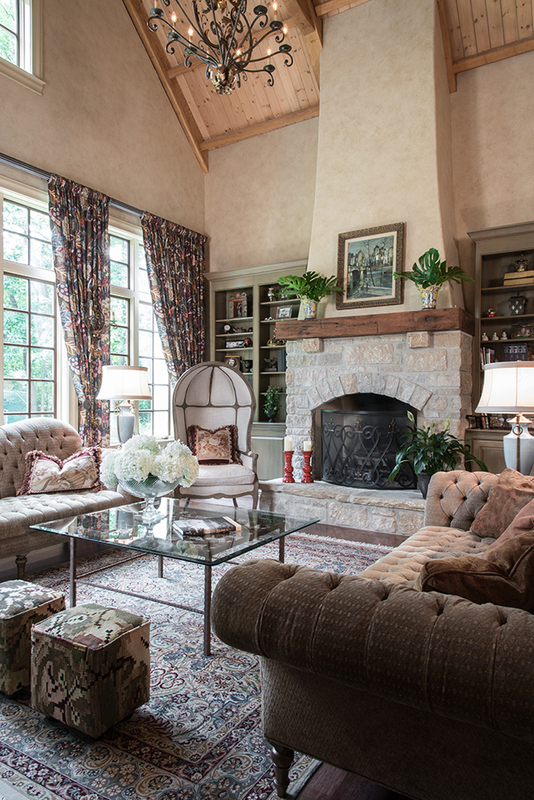 The upholstered furniture is oversized because the large ceilings essentially makes the great room two stories, and “the room demanded and needed the extra weight,” Janice explains. A Turkish rug was a last-minute addition to the great room and was one of the pieces previously owned by the Dubrays. “Janice is great at building existing pieces into existing rooms,” Julie says. A study just off the great room is an ideal open space that can be used for entertaining or as a quiet spot to curl up with a good book. The fabric on the accent chairs and floral Designers Guild wallpaper speak to the conservatory feel of the space with the idea of bringing the outdoors in. The wallpaper has a Japanese-stencil look and picks up tones of aqua, gold and beige. The aqua tone is repeated in the finish of the hand-painted bookcases in the space. Janice also brought a touch of the outdoors into the master suite through the Designers Guild fabric on the window treatments. The soft floral print has touches of gray, lilac and lime green to freshen the bedroom. “The fabric was really the basis for the colors used in the bedroom and bathroom,” she says. Touches of lilac are found in the carpeting, bed linens and the wall color, which has a metallic finish. With all the subtle color in the space, Janice kept the furnishings more neutral. The natural headboard is raffia with nail head trim. Vaulted ceilings add spaciousness, and Janice worked in texture in the chandelier with its rusty, crusty washed-gold finish. In the adjoining master bath, the lilac hue is repeated in the stone flooring, wallcovering and wood trim, which has a lavender undertone. The freestanding acrylic tub looked a little too raw in the space. 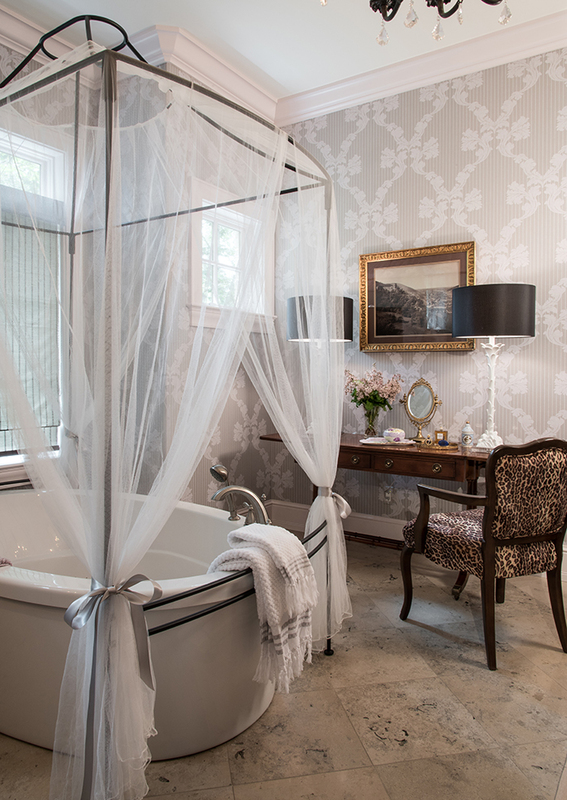 A custom-designed iron-framed bath canopy softens the tub. Playing with texture, color and size, designer Janice Rohan Hulse helped homeowners Julie and Drew Dubray create an elegant, sophisticated home that is still comfortable and liveable for their family of five. Inspired by their European travels, the grand residence is filled with touches of panache.